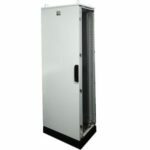 An IP55, bayable enclosure system available in both single door and double door configurations. iLINQ stand-alone enclosures are available in single or double door configurations and can be quickly and easily bayed together. iLINQ LQE Stand-alone offer comes with the above inclusions. If you require your design to be IP55, side cladding or an additional door is required. See below for further instruction or alternatively use the specification guide sheet. 1. Select enclosure model size from Quick Selection Guide in the Specs Tab. The table is categorised by depth (with the subsequent heights and widths shown in the dimension table). The table is incremented from smallest to largest height. 2. Select cladding & mounting components from the range listed in the size selection chart (the relevant part numbers are listed for each size enclosure). Note: Side cladding is mandatory if you require IP55 rating. 3. Select other additional components from the range listed in the selected enclosure column in the size selection chart. 4. If additional information is required see catalogue pages which are linked in the specification table or contact your local B&R representative.